We also offer a 3D rendering service, where either existing 3D files or newly created ones can be rendered to photorealistic quality to illustrate a design or product in situ. Renders for graphic use in brochures, catalogues, company documents or stationary are other areas we specialise in. In addition to specialising in the design and production of jewellery and silverware, we also produce bespoke product and architectural 3D CAD and visualisation work. As well as having the capabilities to model and render designs we are also familiar with producing detailed technical orthographic drawings in adherence to ISO 128 technical drawing standards. At Wax-Masters all work is equally welcomed from the smallest designs tasks to the largest. With our skilled work force, work can be quickly turned around without compromising on quality. Alongside product and jewellery design at Wax-Masters we are also familiar with the realisation of larger scaled work such as architectural projects. During modelling we can use industry standard software such as ‘Ecotect’ to analyse a buildings performance, and with the use of ‘Karamba’ we can use BIM specifications for issues such as beam loadings. Through using software such as Grasshopper in conjunction with Rhino 3D we are able to create generative design possibilities for our clients. Grasshopper works in a way that is very similar to scripting, but in a more visual format. The software gives us the flexibility to create accurate and complex models in comparison to pre-configured wizards, such as ring and stone setting wizards - which don’t always give the desired result. 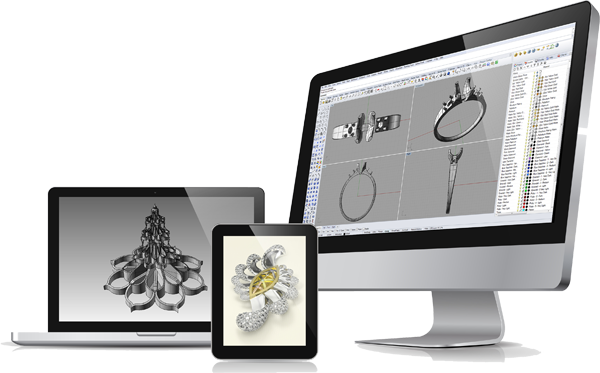 As well as creating computer generated 3D models for jewellery we also undertake highly complex designs for silverware and industrial products. The 3D software we use enables us to analyse how moving parts will interact with one another and give us the facility to figure out and produce models to exceptionally fine tolerances.